Filming on a budget under $30 million isn't really Michael Bay's style - his blockbusters, like the 'Transformers' series, regularly churned out for ten times as much as his latest effort, 'Pain & Gain'. Yet Bay was arguably at his best with smaller scale films like 'The Rock' and 'Bad Boys'. 'Pain & Gain' takes Bay's visual style and infantile humour to a remarkable true story of Miami bodybuilders who turned to kidnap, torture, extortion, and murder. Mark Wahlberg stars as Daniel Lugo, a bodybuilder who aspires to more than just personal training and eyes up the somewhat detestable businessman Victor Kershaw (Tony Shalhoub) as his quick route to success. Kidnap becomes the name of the game, and Lugo recruits fellow bodybuilders Anthony Mackie and Dwayne Johnson (aka The Rock) to help execute his slightly bumbling plans to kidnap Kershaw and force him to hand over his assets. As things go awry for the gang of bodybuilders, the situation escalates and soon kidnap turns into torture, and worse. Not that the Miami Police seem to have any grasp on proceedings, and private investigator Ed Harris has to turn up and join the dots together. But not before the criminal trio end up having to find yet more victims. 'Pain & Gain' may not have the flurry of explosions that stereotype a Michael Bay film but several of his tropes are on offer. Bay's voyeurism/sexism is particularly on fine form with regular glimpses of Bar Paly's arse. His childish humour is also expounded by Christopher Markus and Stephen McFeely's mediocre script, with some jokes bordering on homophobia and racism - two areas that Bay should perhaps best avoid in light of previous controversies. There are occasional amusing lines of dialogue and the chemistry between the central trio works fairly well but it is Bay's visual style that is called upon to retain interest through the two hour runtime. He doesn't quite succeed but the range of camera angles adopted at least keeps the viewer on their toes. A bit of character development would have been welcome though - particularly for the female characters including Rebel Wilson, who is a little wasted as Mackie's romantic partner. As 'Pain & Gain' reminds us on more than one occasion, its story is one based on reality. Although the deranged reality was certainly not one ripe for comedy. 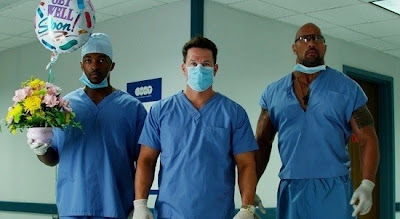 In much the same manner that 2011 comedy '30 Minutes Or Less' suffered in retrospect after finding out the horrible facts of its bomb-strapped-to-victim case, any enjoyment gleaned from 'Pain & Gain' is unfortunately considerably lessened in light of the actual violence and intent. 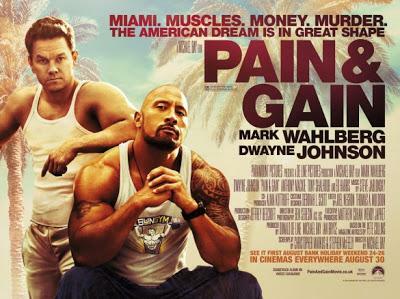 'Pain & Gain' is out in UK cinemas now through Paramount Pictures. Read the Pete Collins newspaper stories that inspired the films.